Launched for the first time outside Russia through Google Hangout, DENAS PCM 6 hit the stands in June. A new kind of medical device designed to address pain, promote energy and speed up healing in a completely natural and holistic approach. KURTISTOWN, Hawaii - June 13, 2016 - PRLog -- eBodyFUSION announced on June 4th this year its worldwide launch on Google Hangout featuring the new DENAS PCM. The launch made the innovative, one-of-a-kind frequency-giving pain relief device accessible to every person in every country in the world. DENAS PCM 6 was originally launched in Russia and is now made globally available for those who can make good use of its benefits. A handheld device uses bipolar electrical pulses (felt as tingles) directed to different parts of the body. As the body receives these impulses, the muscles and nerves react by reducing pain and even speeding up the healing process. The holistic ability of the product also manages to boost the energy of its user when utilized on a daily basis. The science behind DENAS PCM 6 has been studied and verified for over 30 years. It has been known that under certain frequencies, the body becomes more responsive and thus, may be encouraged towards a certain end. Using this knowledge, DENAS is equipped with different adjustable frequencies to be used for different pain situation. Due to its non-invasive use, DENAS PCM 6 may be used on any body part to solve pain and boost energy. To illustrate, there's the 140Hz to 200Hz setting which is often used for quick pain relief. A program "MED" regimen is used to prevent various diseases for those who have a healthy constitution. It also comes with settings ideal for children as young as newborns to 12 years of age. DENAS is equipped with attachments designed to expand its use to different body parts. This includes goggles, a massage set, pencil probe, pad set, and a reflexo for the feet. Manufacturers of the DENAS PCM engineered the product for home use, inputting 24 automated programs to make its use easier. An onscreen instruction is also available for a more comprehensive understanding of how it works. Those who have issues remembering to stick to their regimen can make use of the Scheduler feature which reminds users about their next appointment with the DENAS PCM 6. The training, however, goes beyond what is supplied in the unit itself. Those who will be purchasing the product upon its launch will be privy to a host of online training programs starting with the 7 Day DENAS Training. There's also a 4-Week Self Study Ninja guide for those wishing to learn further before starting their use. Dr. David Ridley MD, from Florida emphasizes the value of the training provided by the manufacturers, commenting that it is one of their best selling point. To expand the knowledge and association of users after a global launch, DENAS PCM providers also have a 24/7 Facebook Group Support, Lifetime Membership, and access to DENAS PCM webinars. DENAS PCM carries a one year limited warranty against defect on workmanship. 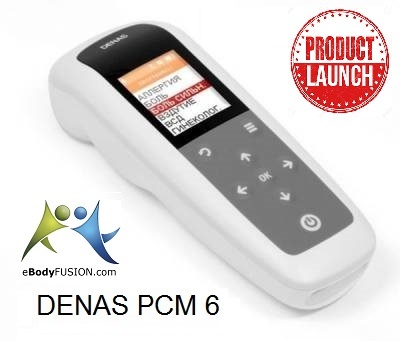 Those who want to find out more about DENAS PCM 6 are encouraged to visit eBodyFUSION's Google Hangout or their official website.